Join us for Live Cooking Demos at Capital! Top 10 Turkey Questions Answered! SubZero WOlf Answers Top 10 Questions about Turkey Prep! 1. HOW DO I THAW A FROZEN TURKEY? for example, a 5-hour soak for a 10-pound turkey, and so on. 2. SHOULD I BUY A FRESH OR FROZEN TURKEY? 3. WHAT SIZE TURKEY SHOULD I BUY? approximately, 1½ to 2 pounds per person. 4. TO BRINE OR NOT TO BRINE? This is one of the eternal debates, one you can only answer by trying both methods for yourself. harder to get a crispy skin. You might try dry brining – rubbing salt on your turkey the night before cooking it. That has worked well for us. 5. SHOULD I STUFF MY TURKEY? before it’s pulled from the oven. Cook the stuffing in a separate dish and use some good stock for the liquid. 6. WHAT DO I DO WITH THE GIBLETS? This consists of the heart, liver and gizzards, usually in a paper bag with the neck inside the turkey. Throw out the liver, and use the rest for gravy – or just throw it all out, and nobody will be the wiser. 7. HOW DO I USE A TEMPERATURE PROBE? remove the turkey and reinsert the probe in the other thigh to check doneness. 8. WHAT COOKING MODE SHOULD I USE IN MY WOLF OVEN OR RANGE? turkey. If you’re using a Wolf convection steam oven, we recommend Convection Humid at 350 degrees. 9. HOW LONG WILL IT TAKE TO COOK MY TURKEY? with Bake. After you remove your turkey from the oven, let it rest for 15-20 minutes before carving. 10. HOW LONG DOES COOKED TURKEY LAST IN THE REFRIGERATOR? Turn on ventilation. • Griddle has a protective coating that must be removed before use. Use hot water and mild detergent to remove. Rinse and dry. • Push and turn control knob counterclockwise to 350°F (175°C) and heat for 30 minutes. After 30 minutes, turn to OFF and allow to cool. • While surface is still slightly warm, pour a small amount of peanut oil or veg etable oil on a paper towel and spread evenly. • Push and turn control knob to 350°F (175°C). Heat until griddle begins to smoke, then turn to OFF and allow to cool. Once cool, wipe off any excess oil. Scrape grease into grease collection tray after every use. • When surface has cooled, wipe with a paper towel to remove excess grease or oil. • After each use, reapply a small amount of peanut or vegetable oil on a paper towel and spread evenly. • Every now and then, remove seasoning by pouring 1/2 cup (120 ml) warm water and 1 teaspoon (5 ml) griddle cleaner onto griddle and scrape residue into grease collection tray, then empty. When dry, reapply a small amount of oil for seasoning. Eye Catching Garage & Laundry Room Organization Made Simple! If you love organization or are m arried to Tim the Tool Man, you will love this! 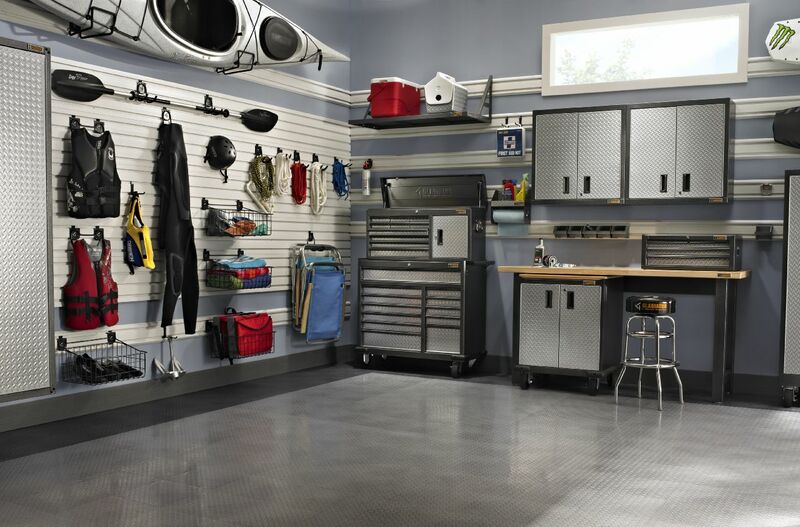 We recently added Garage and Laundry Room Organization systems to our products offered at Capital! This system is fun and is easy to design your own custom space… the options are limitless! Reclaiming space in your home is easier than you might think. Especially when you take an organized approach to the preparation, planning and building steps. A little planning goes a long ways! First step. Clean. Fully Clean out the area so you know what space you have to work with. Next, Plan the space. Measure your space and get dimensions. Think through how you could best use the space. Consider placement of any outlets, windows, etc. Do you have lots of sports equipment to store or tools that need organized? If you have open wall space the Wall mounting systems are a perfect way to eliminate all those piles on the floor. Or to hang wet jackets, life vests, strollers, bikes and more! If you need quick accessible storage, consider open rack systems that help you organize containers and supplies you use frequently. I use mine to store all of my extra supplies like paper towels, toilet paper, diapers, water packs so they don’t take up my space in the home. The pieces come in several finishes and lockers include college team color and logo options! If you are looking for Laundry Room options, this is a great solution to getting organized and keeping the area clean while creating a beautiful look. And it’s durable enough to handle the kids throwing their backpacks on and sitting down to tie their cleats. Finally, Build. Create the space you dream of having. With the simple online design program, we can help you maximize any space to create something you will be happy with long term. New Whirlpool Duet.. Hybrid! Check this out.. Innovation in Dryers. Now finding exceptional care for clothes while using less energy is easier than ever with the 7.3 cu. ft. large capacity HybridCare™ Duet Dryer with Heat Pump Technology. The Energy Star® Certified high-efficiency electric dryer easily installs in more places thanks to the HybridCare™ true ventless heat pump technology. With Advanced Moisture Sensing, three active built-in sensors read incoming and outgoing air temperatures while monitoring moisture levels inside the dryer. This is Frigidaire? Get a Professional Look on a budget! For those who love the look of Professional Kitchen Appliances but know it would break your budget, well look no further! Frigidaire Professional® unveiled its latest suite of appliances and you might be impressed with what you see! 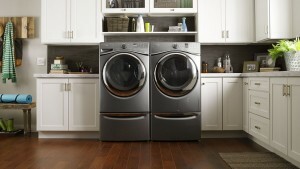 The updated collection focuses on what many consumers are looking for: symmetrical lines, heavy-duty knobs and handles, easy-to-use straightforward control panels and appliances inspired by restaurant-style kitchens resulting in quality tasting m eals from professional, yet affordable appliances. The complete new suite includes seven appliances and are compatible with standard-sized appliances so they fit into existing kitchens, eliminating the need to completely renovate the kitchen. 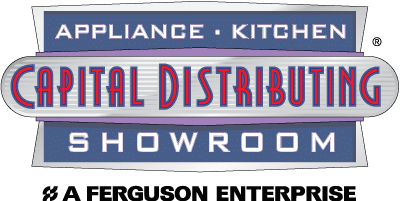 If your in DFW, stop by to see the new Frigidaire Professional on display at Capital Distributing.